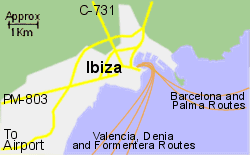 Map of the Ibiza Ferry Port area. Ibiza Ferry Port is located close to the old part of Ibiza city, on the south coast of the island, and has for a long time an important transport facility for the island. 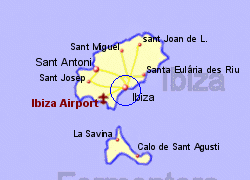 Bus services run from Ibiza to all parts of the island, including the airport (the latter runs every 30 minutes through the day). 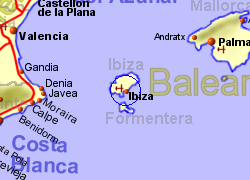 Operated by Balearia with up to 28 crossings per week, crossing time 30 minutes. Operated by Acciona, up to 2 crossings per week, crossing time 4 hrs. 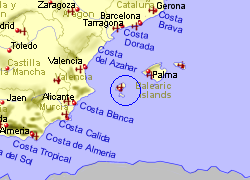 Also operated by Balearia with up to 18 crossings per week, crossing time 3.5 hrs. Operated by Balearia, up to 5 crossings per week, crossing time 8 1/2 hrs. Also operated by Acciona, up to 4 crossings per week, crossing time 9 hrs. Operated by Acciona, up to 6 crossings per week, crossing time 6.5 hrs.